Tonight we will look at the initial results of 15 days of hot weather in the Cedar St. Lab House. NREL is monitoring this project and has kindly provided us with loads (overloads, actually) of data. We have the mountain of data distilled down into some useful charts and graphs and for you “Bottom Liners” we have the total cost of cooling extrapolated. We will analyze what installation factors affect the results we see. Like duct sizing to each room and how that shows up in temperature differentials. This project is interesting because it does not have door actuators and the doors are Closed. It’s a good test of the Tamarack Return Air Path door bottom grilles. We will also answer the question, “If you were doing this project over again, what would you do differently?” Of course the answers on this one can only be finalized after we go thru the winter with the system as it is. 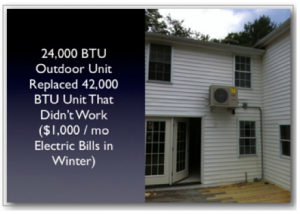 This entry was posted on Wednesday, October 10th, 2012 at 3:58 pm and is filed under D.O.E., DOE, Renovators Webinars. You can follow any responses to this entry through the RSS 2.0 feed. Both comments and pings are currently closed.